Barring a large and unexpected global or financial event, hedge funds are positioned for another year of solid growth as institutional investors seek to gain alternative exposures to traditional equity and fixed income markets. We expect asset flows into hedge funds of at least between $90 billion and $110 billion in 2015. We predict continued flows into equity focused strategies, although those flows will likely be below the 8.6% growth rate ($78 billion) YTD seen in 2014.
Credit strategies will likely see growth similar to that of 2014, which is below its accelerated growth period of 2012-2013; however distressed, a subset of credit, is poised to see more than the $9 billion in inflows they experienced in 2014 as opportunities in certain market segments (US energy, Europe) present themselves. Multi-strategy hedge funds appear headed for another good year in 2015, with flows that may surpass the $48 billion YTD they saw in 2014 as their diversity makes them a natural preference for long-term institutional assets coming from traditional strategies. Macro and managed futures fund flows will likely continue to lag other major market segments with continued consolidation of AUM among the most institutional tailored strategies and further winnowing among small to mid-size systematic funds. When it comes to its growth, and where that growth will be greatest, the hedge fund industry tends to face a dominant short-term and long-term influence. There is consistent evidence to suggest returns influence fund specific flows in the near-term (2-6 months), while allocation preferences and asset class rotation within institutional investors’ portfolios have become the dominant long-term influence on industry and strategy-level growth. If we can understand how these short- and long-term influences manifest themselves, then we can patch together a reasonable view of the future. Entering 2014, we believed the demand for hedge fund products would surpass that of 2013. Through November 2014, investors allocated 80% more to hedge funds than in the full twelve months of 2013, over $112 billion. This represents not only the largest inflows into the industry on an absolute basis since 2007, but also surpasses 2010 on a rate-of-growth basis. To understand why this happened, particularly when “the industry” was broadly described as “underperforming” in 2013, we need to recognize that the long-term trend, driven by institutional portfolio allocation decisions, determines the industry’s growth, while performance determines the near-term distribution of those assets. The logical question then is: Will institutional investors maintain their investments and continue to allocate more to hedge funds in 2015, and if so, at what rate? The short answer is yes, barring a major financial market event, they will. If a major market event were to take place, then only the most defensive asset classes would gain new assets in the very short-term. The variation of flows over a longer horizon, which would be based upon new valuations across many asset classes as determined by whatever the specific event might be, is nearly impossible to predict. While there are many differing opinions on the valuations of securities and assets across the world, there are few who believe a major market event is imminent, so we will operate under those assumptions, but with keeping what a truly adverse scenario could look like in our back pocket. 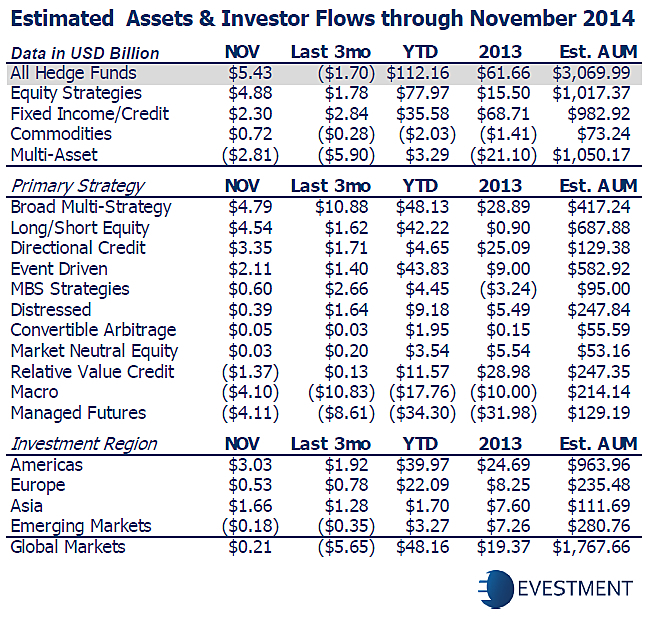 So what will drive the flow of assets into hedge funds in 2015? The same influences which drove growth in 2012 ($25 billion), 2013 ($62 billion) and 2014 ($112 billion); the desire from institutional investors to gain alternative exposures to traditional equity and fixed income markets in the face of rising equity market valuations, compressed spreads and low interest rates. Entering 2014, we believed the redistribution of traditional long-only equity gains would manifest in equity hedge fund inflows, while the long run of large inflows into credit strategies would not be supported to the extent they had been during the prior two years. These forecasts generally went as expected in 2014, with equity-focused hedge funds receiving nearly $80 billion and credit strategies just over $36 billion, the latter accounting for slightly more than half its prior year inflow. In 2015, with verbiage from the US central bank indicating a possible rate increase, thereby requiring greater flexibility to successfully generate returns in fixed income universes, and equity returns expected to be below the pace of the last two year run, we expect these two segments to normalize with each other in terms of investor interest. While there is a lot of institutional money to be redistributed away from US equity exposure, the current environment seems to favour portfolio policy shifts as well. While we expect the continuation of flows into equity focused strategies (event, activist, long/short), they will likely be to a lesser degree tha n 2014. Credit strategies are faced with their own set of difficult circumstances, primarily the string of negative returns produced to end 2014. Because of this, it is difficult to see a meaningful increase in the rate of flows over 2014 into the credit universe in the near term, with the exception perhaps being into distressed ($9 billion of inflow in 2014) and special situation funds where opportunities appear to be rising in certain market segments (US energy, Europe). If equity and credit fund flows combined are less than 2014, and we believe flows will be within the range of 2013/2014 averages, then where else will money head? If traditional strategy flows for the last two years, along with a dominant trend in hedge fund inflows are a useful guide, then multi-strategy hedge funds appear to be headed for another good year in 2015. In the last two years, global balanced strategies have been investor favorites from traditional asset managers and multi-strategy hedge funds have had positive investor interest nearly every month of that span. The group’s diversity makes them a natural preference for traditional dollars rotating into the hedge fund industry and allocations at the rate seen in 2014 will likely continue. One big question mark remains about where assets will be distributed across the hedge fund industry in 2015; the fate of global macro and managed futures strategies. The two have faced persistent redemptions for each of the last two years, with negative sentiment enduring longer for managed futures funds. While the long-term trend has been positive for equity, credit and multi-strategy hedge funds, these two aforementioned segments, at the aggregate level, have not taken part in the growth enjoyed by their peers. We know there is demand for global tactical allocation products offered by traditional managers from institutional investors, the closest traditional universe to global macro strategies. eVestment’s Asset Flows shows institutional investors have allocated nearly $ 80 billion to GTAA products in the last two years, more than any other segment except global fixed income, and ahead of emerging markets and global equity. Producing industry leading returns in the final months of 2014, and entering 2015 with an elevated level of global economic/political uncertainty (which makes less correlated strategies more popular), should at least bring macro and managed futures funds into the conversation. What is less in their favor is that systematic, derivatives-focused strategies are not a clear replacement for any traditional strategy, or market exposure for institutional investors. This is likely the primary reason the long-term trend of industry-wide inflows has not lifted the group in aggregate and will likely continue to weigh on these universes. A potential long-term outcome is that proven, institutional-quality operations in the managed futures space will maintain assets and likely enjoy greater capital raising success in 2015 than in recent years, while the remainder will fight for assets with many funds doomed to fail. In the end this will result in a stronger, if not more homogenized set of strategies that can then develop into a marketable universe to institutional investors. Global macro strategies will likely endure a similar fate, but with less carnage along the way due to the existence of fewer mid-sized systematic strategies and a higher concentration of institutional quality firms. The universe of macro funds will likely see inflows sooner and in greater size than their managed futures peers in 2015, but will likely lag at the aggregate level behind credit, equity and multi-strategy funds. The hedge fund industry is, barring the occurrence of an outlier event, well positioned for another year of solid growth. The roles of hedge funds, and the expectations of their results, have become better defined for institutional investors’ portfolios. While there will always be investors for whom certain strategies do not fit within their scope or scale, the global institutional investment landscape dwarfs any one participant. With long-term trends in place and the future of global markets ever uncertain, hedge funds will continue to evolve into an institutional staple, with some casualties and great successes along the way.